Galeon 460 Flybridge Motor Yacht 2018 for sale in Florida : Atlantic Yacht & Ship, Inc. This Euro style Flybridge offers all the amenities of a large motor yacht in an Owner manageable 46 feet! The 460 Flybridge Galeon has an open layout. Hence, the Owner/Captain may converse with guests while maintaining full view of the waterway. Massive windows allow plenty of natural light to illumine the custom walnut interior. 3 luxurious staterooms comfortably accommodate family and friends. Seating and sunning options abound on the 460 Flybridge Galeon. For example, the bow features convertible sunpads that go from seated to reclining positions. The Flybridge features similar options for lounging and entertaining. There is an umbrella shade for bow seating and a full bimini on the flybridge for shade. This like new, 460 Flybridge Galeon is for sale! She comes with a 6 year extended premium warranty on her engines, generator, and accessories. In addition to the luxury package, her owner has added over $45K in quality upgrades! 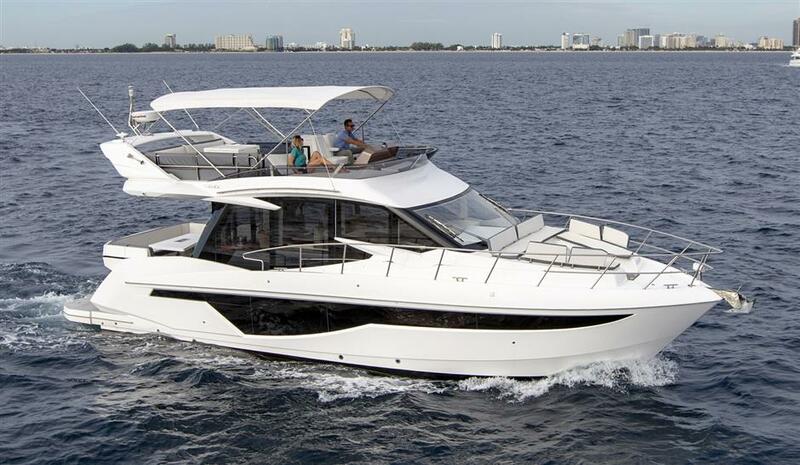 See this 460 Flybridge Galeon today in Ft. Lauderdale! Contact Haley Walker at 850-643-7395 or email haley@ayssales.com. Established in 1982, Galeon specializes in motor yachts up to 25 meters in length. Built in Poland at their ultra-modern manufacturing facility spanning over 26,000 square meter, Galeon is one of Europe’s leading yacht manufacturers. The yachts are designed by World renowned naval architects such as UK’s Tony Castro. Every model in the range has unparalleled modern styling and technology. Galeon’s ability offers tailor-made yacht solutions in various sizes, which makes every vessel exceptional. For over 56 years Atlantic Yacht & Ship has been serving the yachting community. Our headquarter sales office is dockside at Harbour Towne Marina. That’s in the heart of the yachting capital of the world, Fort Lauderdale, FL. Turn to AYS for the highest quality service and sales in the yachting industry today. Whether you are looking at yachts for sale, or thinking about selling your yacht. Remember, it is always wise to have an experienced broker representing your interests throughout the deal. Contact Atlantic Yacht & Ship at 954.921.1500 or click here.